Momofuku Ando is either the best thing that ever happened to ramen or the worst. As the inventor of instant noodles and founder of Nissin Foods (with its iconic Cup Noodles and Top Ramen brands), no doubt he brought ramen to the masses. McDonald’s may seem to be the ultimate industrial-food success story, but that title more rightly belongs to Ando: Instant noodles boasted more than 100 billion served in 2012 alone. But something darker can be laid at Ando’s doorstep: His products’ success has co-opted the word “ramen.” The sum of our collective ramen experience derives from his instant stuff in our hungry college days rather than real ramen. Yet, instant ramen has about as much to do with the genuine Japanese article as Chef Boyardee ravioli does with the authentic Italian dish. Real ramen is a deeply soulful Japanese soup consisting of wonderful, Chinese-style alkaline noodles served in a meat (pork or pork /chicken) broth (sometimes flavored with soy sauce or miso), garnished with toppings such as chashu (sliced pork, soy-marinated soft-boiled egg),menma (pickled bamboo shoots), wood-ear mushrooms, sliced scallions and dried nori. The latter, while visually appealing, detracts from the central porcine theme. Other toppings can be added. Some of the best ramen in San Diego is at Ramen Yamadaya (4706 Clairemont Mesa Blvd. in North Clairemont). This outpost of a small, Los Angeles-based chain specializes in tonkotsu-style ramen featuring a deep-flavored, thick and rich pork broth. The Yamadaya experience is not entirely unlike a long hard draught off a bowl of melted pig, and that’s not without good reason. To make that broth, 24 pounds of pork bones are boiled hard for 20 hours until they collapse from their own weight. It not only tastes like the essence of pig; it is the essence of pig. The best dish at Yamadaya is the tonkotsu kotteri, featuring a brilliant broth with a hit of extra fat from the pig’s back and drizzles of slow-charred black-garlic oil (both earthy and ethereal). These additions lend still more depth to a broth already unfathomably endless. Halfway through a bowl of kotteri, the overall impression is of an umami bomb having detonated inside your head—and yet you don’t want it to stop. Also excellent at Yamadaya is the spicy tonkotsu. It’s less spicy than the name might suggest but with the flavor of the chile coming through and serving as a foil to the rich broth. Another excellent option is Yamadaya’s gyoza, a Japanese version of Chinese pot stickers with one side fried and crispy, the other sides steamed and pillowy. There are other broths and other dishes, most of them excellent, but it’s the tonkotsu that I want at Yamadaya. True ramen is the anti-Ando. Variations on the ramen theme are only limited by the number of permutations of the three basic elements: broth, noodles and toppings. Regional variations abound. It’s more akin to American barbecue than the instant ramen ever could be. 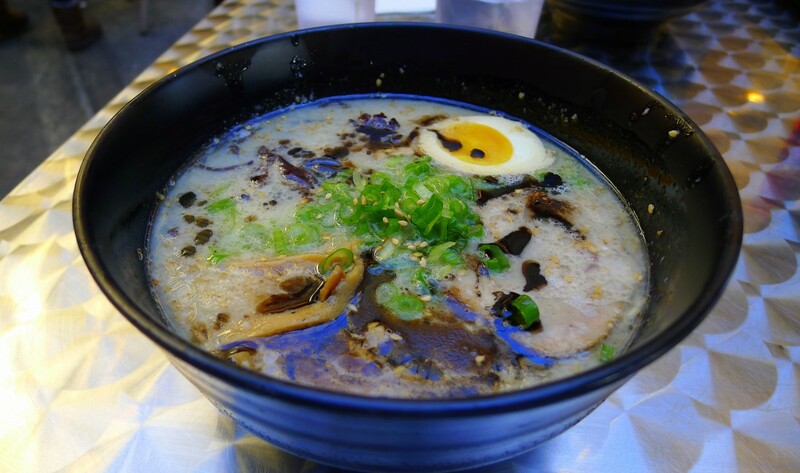 And Yamadaya’s passionate tonkotsu may be the ultimate proof of that.